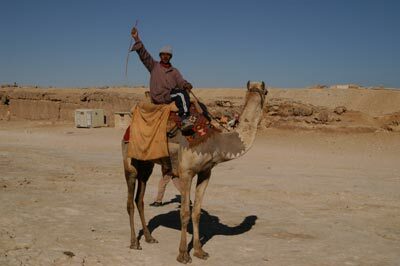 There are a number of stables for horses and camels around Giza -- it is possible to rent either and ride to Saqqara, or just get aride around the pyramids. FOr the most part, camel rides around Giza are a bit of a scam -- high price, and they are used to dealing with thousands of tourists every day, so it's a bit too..."SMOOTH' for me. THey are definitely colorful, though. Still, it can be fun. However, try to avoid the freelancers around the Pyramid of Chephren -- while they are very nice, and definitely interesting to talk to, they are pretty aggressive and can have a high-powered sales pitch. We had a very interestng conversation with a camel driver named Sammy, and some obligatory pictures, for the obligatory baksheesh. We weren't very good at haggling yet, so it was a little uncomfortable.